Maybe I should have used headphones in the photo of the µDAC5 but hopefully the size of a CD is familiar, the idea of course is to give an indication of how compact this digital to analogue converter is. There are smaller, the AudioQuest Dragonfly and LH Labs Geek come to mind, which are also portable DACs but have a built in USB plug for computers. The µDAC5 differs from those competitors in having RCA analogue outputs as well as a minijack socket for headphones, this means you can hook it up to a domestic system with regular interconnects. The other obvious difference is that it has a proper volume knob, the competition tend to require volume control via the computer albeit not the standard one on the keyboard but something found in software. The one on the keyboard will change level but has a markedly negative effect on sound quality. Note that the Nuforce and the DACs mentioned above are USB powered devices with no internal power supply, so they can’t be used with smartphones, there isn’t enough power coming out of a phone to drive them. The spec on this little DAC is very much up to the moment with support for PCM up to 384kHz and quad DSD (DSD256) as well as the totally audiophile DXD format. 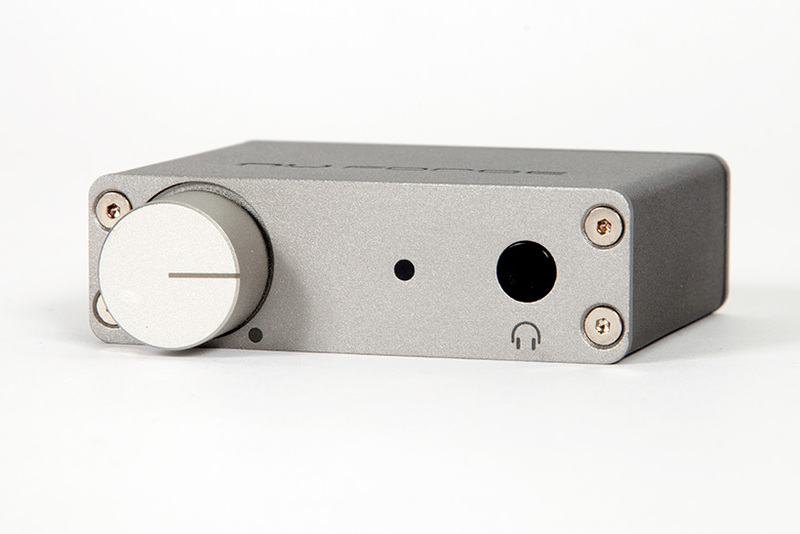 Numbers that are as high as almost many in the audio sphere, so does this sound like a state of the art DAC? Not exactly, it sounds good no doubt but it also proves that there’s more to digital to analogue conversion than numbers. There are in fact some similarities with the Geek, both have a slightly ‘amped’ sound, the tuning is not as neutral as mains powered DACs but a bit more exciting and dynamic. This makes classical pieces a bit more lively and engaging but can get a bit edgy with recordings that are already energetic. With Pepe Habichuela and Dave Holland’s flamenco (Hands) for instance the extra bounce it introduces makes them sound more like Rodrigo and Gabriela. But it does no harm to the ‘Chili Pepper’s Walkin’ ‘On Down the Road’ (Uplift Mofo Party Plan) which is already a high energy track that in the µDAC5’s hands has plenty of weight and funk even if it’s a little more eager than usual. With a DSD piano recording (Beethoven Sonate 32, Maestoso, DSD64) you get a lot of the poise in the piece as well as a decently quiet backdrop. The Chord Mojo (portable DAC) on the other hand is considerably more refined, relaxed and revealing but it is twice the price. These impressions were made with the µDAC5 connected to a Melco N1A digital server, a more appropriate partner in the form of a Macbook Air laptop was used to contrast the DAC with an AudioQuest Dragonfly V2. The Nuforce managed to outgun that less expensive converter with ease by making instruments and voices sound more real and delivering transparency, ‘air’ and depth. It gave the Be Good Tanya’s back their class and made a good fist of Frank Zappa’s often dense ‘The Ocean is the Ultimate Solution’ (Sleep Dirt). Moving back to the Melco reveals the sort of upgrade expected by sounding faster and more dynamic if still a little forthright. A colleague also gave the µDAC5 a spin using a PC running Windows 10 and JRiver Media Jukebox software and came back with the following observations.The DAC was initially connected to the PC and used with a pair of balanced armature high resolution earphones. The sound was fast and open but didn’t get harsh until extremely high volume levels were tried. The combination offered a realistic image that sometimes managed to transcend the middle of the head effect and move to what can be perceived as ‘in front of the head’. The differences between 96/24 and 192/24 material were not substantial but easily noticeable. The same comparison with 44.1/16 produced a much more obvious transformation with greater headroom and speed added when the same track (Patricia Barber’s version of ‘Summertime’, A Distortion of Love) was played via the µDAC5. The bass performance was clearly improved so that it integrated seamlessly with the low mid frequencies, creating a tight well defined background that extended the double bass far beyond the performance heard from the otherwise high quality CD recording. The µDAC5 was also connected to a home stereo system that included a Krell integrated amplifier as well as NuForce's own DAC80 mains powered DAC. In this instance it became quite clear that the power supply offered via the USB connection will never be able to match the toroidal transformers of a mains device. The µDAC5 sounded good and tight, smooth and bass rich in all the right places but was not able to compete with the more astute and far more expensive components when it came to height, width and especially depth of soundstage. 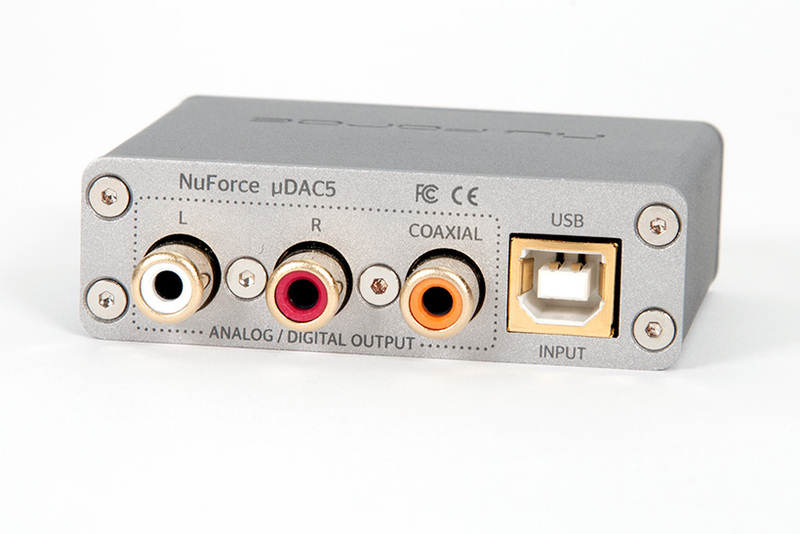 The Nuforce µDAC5 is a cute little converter that ticks all the boxes spec wise and delivers an energetic and entertaining sound. It is transparent to source and format quality and would make a good starting point for those taking a first step with computer audio.